This entry was posted in Just Life on December 19, 2016 by Steve Tilford. I’ve never watched a complete silent movie. I’ve seen pieces of them, but have never watched a complete movie. It is strange to think that it really isn’t that long ago when silent movies were just movies. I say that knowing that it has been the better part of a century since they were the norm. I saw an article that said that 70% of all silent movies are lost That is amazing. And sad. I didn’t talk to my grandmother much about her experiences playing the piano. I only heard her play it a few times. One night, late, she came out of her bedroom in her nightgown. She walked to the piano and sat down. And she started playing wonderfully. She did this for maybe 15 minutes, then stood up, without saying a word, and went back to bed. She was in her 90’s by then, and I hadn’t seen her play for many, many years. It was a great life memory for me. Okay, I have a neurology appointment soon at KU med in Kansas City. I have some questions, so I’m looking forward to it Plus, my iPhone is fixed, so I need to go by the Apple Store and pick it up. Wow, that’s a great story about your grandparents. I did a couple of live silent movie soundtracks (both of the more experimental, later silent film variety) in my 20s playing the cello. Also saw Gary Lucas (of the later Captain Beefheart band) do a live soundtrack to the 1931 Spanish Dracula film, which is an excellent cinematic version of the story. 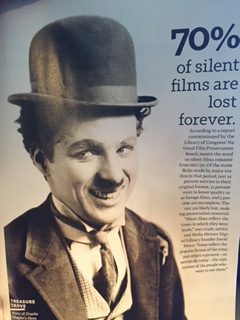 My wife is sortof an expert on silent film (she’s written a book about it) and especially the music that went with it. She started a silent film series with live music accompaniment at her school. Your Right Steve, It Is Sad. The movie that came to mind is The Great K & A Train Robbery. This was filmed in the Glenwood Canyon around 1926. Our historical Avalon Theater showed this film with a local clarinet and piano players. Both musicians were grey hairs and Grand Junction has yet to show another silent film. Side Note: During the film, one of the bank robbers is “relaxing” in a hammock UNDER THE MOVING TRAIN CAR. The lead actor jumps his horse off a TWO STORY BALCONY into a water feature. That sure doesn’t happen these days. P.S. Thanx 4 the grandmother story. You should give the film “The Artist” a try. Won the Oscar a few years ago. It’s extremely well done. Great story too. Mad dad (had he lived) would be 100 next Monday. Try Mel Brooks’ “Silent Movie”. Do yourself a favor and watch the movie The General. It was sooo damn good. Somebody even uploaded it to YouTube. Naturally they eventually made a movie about the lost movie! We watched “The Kid” on Amazon Prime about a year ago for an impromptu family movie night, and it absolutely stands up as great entertainment.